I’ve spent the week being a hazard to myself and others thanks to the loan of an Emicro One powered scooter. I’ve never been good at skateboarding. So, in the early 80s, I was a BMX rider. However, Micro Scooters has noticed a growing trend and has birthed a version for those who want more speed but without the extra effort. Please welcome the Emicro One powered scooter. When I was asked to review this electric scooter I was excited. Perhaps a little too excited for a man of my years. To be honest, I was expecting something with a throttle that would power me effortlessly through the pedestrian masses. I was wrong. The Emicro One works in a similar way to those power-assisted bikes. Basically, for the effort you put in, you get a lot more in return. This also makes hills less of an issue. Chances are, you’ve seen kids blazing up and down the pavements on their scooters. Well, this one looks pretty much like one of those, but bigger; and more black. Just like the kid’s models the company sells, this scooter can be folded when you need to store it or carry it on to the tube, for example. The main difference in design between the Emicro One and the less adult versions is the height the handle bars can go up to and the size of the foot-plate. Folding is taken care of by pressing buttons at the base of the handlebar stem after unlocking a latch. The handlebars are also locked in by at latch as well as a locking button. I do like the fact that this has a little kick-stand too. Very handy when stopping off for a refreshing beverage. The brake, just as on other scooters, is a rear mudflap that you heel down on. There’s even tech here as, just like Grand Prix cars, regenerative breaking helps recharge the One’s battery. So, the tech bits. As I mentioned, there is no throttle to squeeze or twist. There’s actually no real evidence that this is an electric scooter until you look really closely. The only giveaway is four LED lights on the foot-plate that tells you how much charge you’ve got left. This only lights up when your using it. The other hint is the fact that it’s not as light as you’d expect a regular model to be. It only weighs 7.5kg (16lbs) but that feels hefty if you’re not prepared for it. The scooter is light enough to carry on to public transport though. The One does a decent job of looking grown-up (that’s coming from a rock musician though), whilst retaining that juvenile sense of fun. Marked proudly with ‘Swiss Engineering’, the Emicro One is certainly well built. 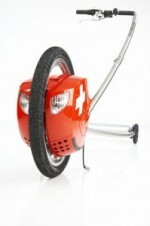 As previously stated, this scooter electrically assists your scooting so be prepared to scoot. That said, the Emicro One does give you a decent boost. To activate the power assist just tap the break three times with your foot. Do the same again in order to deactivate. Once you’ve pushed off and the electric motor kicks in your scoots can be less frequent as the distance covered in between them has been increased. You’ll soon be overtaking pedestrians with very little effort. Kinda like cars, the One has three performance programmes to dial in from the 500W motor: Eco, Standard and Sport. As you can see, the modes limit the maximum speed of the support and the maximum power of the motor. So, select Eco and you can cover more distance on a single charge but your assisted top speed will be lower. Not that distance is a major problem, as this electric scooter has a range of around 12km on a single charge. Using it to commute should give you a couple of days without having to plug it in. Even if you do have to charge it, you’re back up and running within 60-minutes of plugging it into the wall. 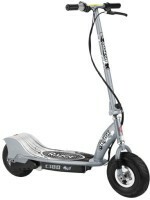 It’s probably also worth remembering that, even with a flat battery, you can still scoot manually. Once used to the addition of power assisted scooting, it gets really fun. You see, not only does it take less effort, you don’t even need to scoot all the time. Once cruising you can keep your speed up just with the occasional light push, or by simply shifting your body-weight forwards in a kind of rocking motion. The thing is, with size 10 feet in boots, finding space on the footplate wasn’t always relaxing. Even if I kept my back foot with its heel hovering over the break space is at a premium. Most of the time, the 25kmh (over 15mph) was plenty for me as this feels quite fast on two little wheels. The scooter seems to recognise when you’re going uphill and adjusts the power output accordingly to compensate. I did enjoy that added power boost. Once I got my skill and confidence levels up I was soon (safely) weaving my way through quiet suburban areas and pedestrian precincts. Smooth was how I’d describe the power delivery. Smooth is also the kind of surface that works best. There is some give from the dual core wheels but a lot of shocks are still fed right up from the wheels to the handlebars and deck. Just like any other scooter, really. This thing is fun! As you can see in the video of my first attempt, I started off quite unsure. However, it doesn’t take long before you’re nipping up and down confidently. Be prepared for some quizzical looks though. Even in hipster-central, I got some odd looks. Perhaps it was because I was wearing a biker jacket whilst pushing an electric scooter around? I did enjoy overtaking kids, as well as some cyclists – and I’m not even that competitive. The handlebar post is only just long enough for me, I am just over 6 feet tall (1.89 meters). I would also prefer a little more room on the deck. At the end of the day, I really had a blast. I would actually now be tempted to get one but, there’s the issue of price. The Emicro One is available now direct from Micro Scooters and costs £750. That’s slightly too rich for my blood but if I was looking to buy a Brompton, for instance, it could be tempting.